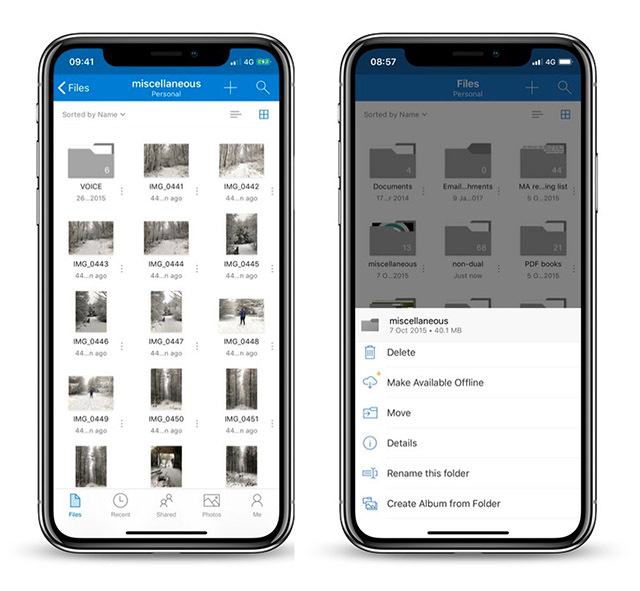 Microsoft has released an update for the OneDrive app on iOS which brings support for the Files app on iOS 11 along with a number of other new features. First and foremost, the app now has a redesigned interface which makes better use of screen real estate and makes file names easier to read. Secondly, a new ellipsis button next to each item brings up a new contextual menu, eliminating the need to long-press a file to take actions. With the new update, thumbnail images on the app are now larger making them easier to spot. Shared files are more clearly visible and the multi-column list view for iPad users has been redesigned to make it clutter free, with more room for items and filenames. Another new feature in the latest update is the expanded preview support for over 130 file types, including Adobe Photoshop, Illustrator, RAW, 3D objects, high-precision DICOM, TIFF files, iWork Files, Java/C/Swift, etc. OneDrive now also supports drag and drop which allows users to easily drag files to emails and move them between different tabs on the iPhone and iPad. The update also includes iPhone X specific changes to the UI, which take into account the device’s signature notch. In addition to all the new features and UI changes, the update addresses a number of annoying bugs on the app, including one which made search results vanish whenever a file was opened. Microsoft has been hard at work to improve its cloud storage platform OneDrive. The company recently announced a major update for OneDrive for Businesses with a new files restore feature. The files restore feature will allow users to recover all of their files in case of emergencies.